Amid the dusty showgrounds of bleak regional Australian towns, ex-soldier Ben Wallace and his sidekick Mikey run the Target Ball sideshow in a travelling carnival called the Kingdom. Alongside the regular punters – ‘bored women dragging slouching kids and unemployed husbands around the stalls’ – they entertain another kind of clientele, more interested in the crystal meth Ben deals on the side. It’s a slick operation – Ben has cooks scattered throughout the countryside and the perfect front for evading detection. But Mikey, better known as wannabe rapper Mekong Delta, has a loud mouth and restless legs, and it’s not long before his thirst for thrills gets him into trouble. Chris Flynn has a real flair for language – in his debut novel, A Tiger in Eden, he played with his tough protagonist’s Belfast dialect to create a uniquely authentic voice. In The Glass Kingdom, the author has upped the ante, inhabiting multiple characters. The gruff and cynical Ben, haunted by his military past, carries mental and physical scars that he grimly embraces as much as he runs away from. A brief, lyrical interlude through the eyes of an elderly Welsh carnie is a poignant and effective vehicle for exploring the history of the Kingdom and its subjects. The real standout, though, is the scattered and hyperactive Mekong Delta. Mikey talks in the affected ghetto-speak of bad Aussie hip-hop, full of manic, run-on sentences and feverish reality-TV daydreams. It could be a recipe for disaster, but Flynn’s commitment to and consistency with the vernacular turns Mikey’s posturing into a reflection on the young man’s ego and scattershot ambition. Flynn plays with ideas of violence as catharsis, and tests the reader’s sympathies as characters blur from men to monsters and back again. 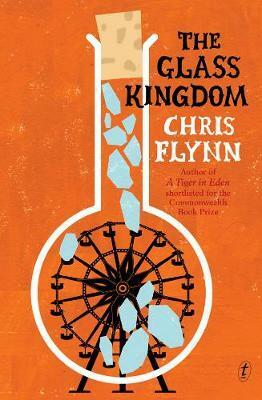 Smart and wryly funny, The Glass Kingdom is an engrossing read from a skilled practitioner of contemporary literary fiction.